Hunger has a woman’s face. In nearly two-thirds of countries, women are more likely than men to report food insecurity. Central and Southern Asia is the region with the largest gaps, with women being 4 percentage points more likely than men to report food insecurity. In Europe and Northern America, 9 per cent of women and 8 per cent of men reported food insecurity. The gaps however vary across countries: In Ukraine, for example, 19 per cent of women and 14 per cent of men reported food insecurity. The world’s worst food insecurity is in sub-Saharan Africa, affecting half the population. Yet, 10 per cent of women in the United Kingdom also cannot count on having enough nutritious food, a share slightly higher than for men. Women and girls prepare most of the world’s household meals and grow much of its food. Globally, almost one third of employed women work in agriculture, not accounting for self-employed and unpaid family workers. Yet, only 13 per cent women are landholders. In some parts of the world, such as South Asia and sub Saharan Africa, more than 60 per cent of all working women are working in agriculture, concentrated informal and poorly paid jobs with little or no social protection. Not having equal access to land or credit, technology and markets leaves many on the margins of subsistence agriculture. When times are tough, gender discrimination means women and girls may be the first to eat less, even as they work harder to secure food for their households. For pregnant and lactating women, inadequate food and poor nutrition imposes a risk of anemia, a leading cause of death during childbirth. UN Women acts to stop hunger by supporting women’s role in food security, as the cornerstones of food production and utilization. This is often through advancing gender- and climate-smart agricultural policies. We help rural women access and control productive resources to increase their income security and sustain higher agricultural productivity. In Albania, Bosnia and Herzegovina, former Yugoslav Republic of Macedonia and Moldova, UN Women is working with governments to implement gender equality commitments and women’s participation in decision-making. With the help of a subsidy scheme, Gentiana Sinjari installed a drip irrigation system essential for her crops’ survival, and Zilha Kureševic from Bosnia and Herzegovina, who lost her job as an accountant and was looking for ways to feed her family, started cultivating strawberries with the help of an agricultural scheme. The Cheese Exchange, a UN Women initiative, brought entrepreneurial Tajik and Swiss women cheese makers together to share skills and develop new dairy products for Tajikistan. Aisulu Jenalieva, 48, has gone from being an abandoned wife of a migrant worker without the means to support her family, to leading a self-help group and collective that runs Jirgatol district’s first dairy production facility in north-east Tajikistan. 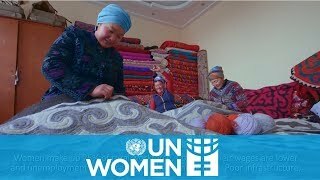 She received technical knowledge and business support from UN Women. This study provides an analysis from a gender perspective of policies, programmes and services related to agriculture and local development, as well as an assessment of the extent to which rural populations, especially women, benefit from these.